There appears to be a natural mechanism, as fundamental as E= mc2 in physics and as pervasive as natural selection in biology, by which everything seems to form and evolve, including matter and mind. There have been scientific reports suggesting striking similarities between behaviors of complex networks, ranging from tiny brain cells to atoms, the Internet, and even planets and galaxies. A comprehensive study of network cosmology published in a 2012 issue of the journal Nature suggested that structural and dynamical similarities of networks, such as these, point to a common universal growth process. Yet, the nature and origin of such a process still remains elusive. 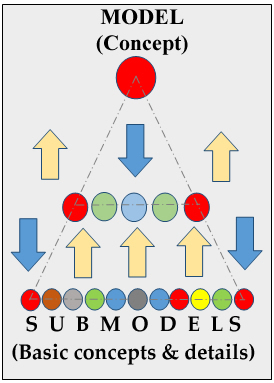 Yaşar describes a dual process (deductive/inductive or distributive/associative), shown in the adjacent figure, and establishes the following operational definitions to explain the mechanism: a) matter and mind contain packets of energy and information that conceal their internal elements from outside observations ─ much like a model or an abstract representation, and b) models either break down deductively (i.e., distributively) into smaller parts (submodels) or unite inductively to form bigger models as a result of a trial and error process driven by various conditions and a collective behavior of parts, and relationships and rules of engagement among them─ much like a simulation. He uses the term model to refer to every distinguishable matter (e.g., an electron, a neuron, an atom, an apple, and a planet, etc.) or information (e.g., a concept, a thoery, an assumption, a word, a sentence, and a book, etc.). Based on these operational definitions and decades of experience using computational modeling and simulation technology (C-MST) in scientific research and based on empirical evidence from cognitive psychology and neuroscience research as well as pedagogical use of CMST in teaching and learning, Yaşar constructed a process by which everything seems to work, including mind and matter. As the matter in the universe seems to have been following this bidirectional process, an obvious question is whether or not humans have utilized the same operational structure of the mind and brain to take advantage of the dual evolutionary process in its completeness as frequently as they could have. Yaşar suggests “Not, when it comes to the things that involve free will.’ For involuntary functions of storing and retrieving data, the brain follows this process. When new information arrives, it lights up all related cues, neurons and pathways in a distributive way, and when it retrieves a memory it attempts to reassemble the original pattern of neurons and pathways in an associative way. But, when it comes to checking the validity of our assumptions, beliefs, and habits, we tend to avoid an effortful cognitive activity of this kind and continue the same stand as long as we can. A scientist’s mind is a good example that implements the dual process rigorously, consistently, and frequently ─that is why science and technology have progressed so much since the use of scientific methodology (modeling, testing what-if scenarios, and re-modeling) started several hundred years ago. Yaşar alerts us of a great opportunity, through CMST tools, to expedite the dual process of thinking, progression, and decision making ─ not only in research but also in the learning of complex topics in science, technology, engineering, and mathematics (STEM) by new generations. Full awareness of how best the mind is meant to work could help us all make better decisions in the face of confusion by correcting our misconceptions. Slow or fast, our minds will continue to evolve along these lines and perhaps one day we could gain a more universal awareness that is mindful of everything around us and free of unfounded assumptions which often create tensions and animosities among humans. But, we can set the pace of this progress to save time and energy and to minimize loss. Dr. Osman Yaşar, Empire Innovation Professor and Director of CMST Institute, The College at Brockport, State University of New York, Rochester, NY 14604.